Shaving causes friction against delicate hair follicles. Without proper lubrication between your skin and the razor blades, a condition known as razor rash can occur. Inflammation and redness go hand in hand with razor rash; however, as your skin heals, darker discoloration is apt to form. This discoloration gives your skin a spotted appearance and is due to scarring. To eliminate spot marks caused by razor rash, take steps that reduce discoloration as well as tissue damage. Wash your face twice daily with an antibacterial cleanser. Using a laundered washcloth, thoroughly wet your face and massage in a small amount of cleanser. Rinse with warm water and blot dry with a clean towel. Also use an antibacterial ointment or cream to reduce any infection that may be contributing to skin discoloration. Massage your face with a facial moisturizer immediately after cleansing and shaving. According to "The Doctors Book of Home Remedies," moisturizing your skin will stop itching and dryness. This is turn allows for your skin to heal properly and discoloration to fade. Dab on an over-the-counter glycolic acid lotion of 8 percent strength. According to the American Osteopathic College of Dermatology, glycolic acid is effective in treating razor rash and discoloration. Prescription retinoids are a stronger treatment that reduce scarring within two to three months of continued use. 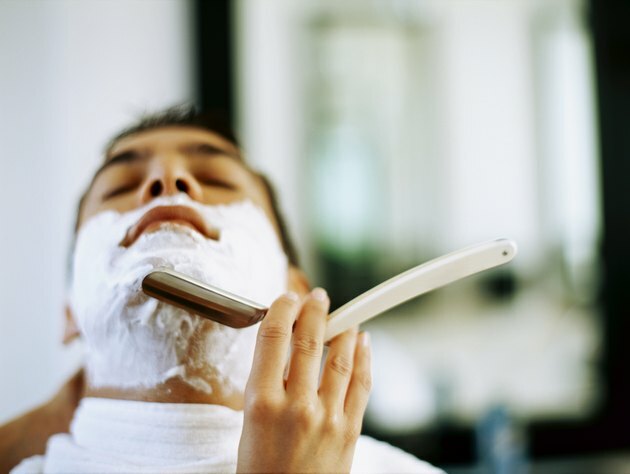 To help prevent razor bumps, shave your face less often and use a single blade or electric razor. According to the American Osteopathic College of Dermatology, shaves that are too close aggravate skin and can worsen scarring. Always shave with the grain of hair growth while avoiding pulling your skin taut as you pass the razor across. Follow with an aftershave designed to deeply moisturize skin.